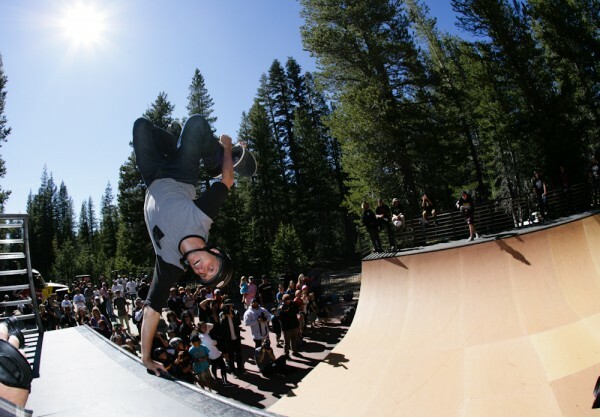 Last Saturday Woodward had its grand opening of its newest skatepark at Lake Tahoe, California. This new facility has an indoor concrete skatepark, mini-ramps, and a mini-mega that you can launch into a foam pit or onto the soft resi landing. Outside there’s a nice super wide mini-ramp and of course snow if you’re into snowboarding—year round! Tony Hawk got a nice private jet ride up from Carlsbad with his son Riley and Brian “Slash” Hansen joined them too. The Birdhouse team was on hand with Jaws, Clive Dixon, Candler Woods, and Shaun Gregoire. Andrew Cannon was there to skate and announce, Brian Schaefer from SPoT was there filming a SPoT Life episode, Curren Caples was flying all over the place, and Mike V killed the mini ramp demo with old school and new school tricks on his retro Elephant Brand shape. Check the photos below, and the video is right here. Oh yeah, book your skate camp now!